I can honestly say, I have never met a Panzanella I did not Love Growing up in our family, my brother and I used to fight over the bottom of the salad bowl – you know … the loose bits of salad left with the delicious dressing. We would dunk our bread in and soak it all up and look victoriously at the other as we enjoyed our salad bowl coup. 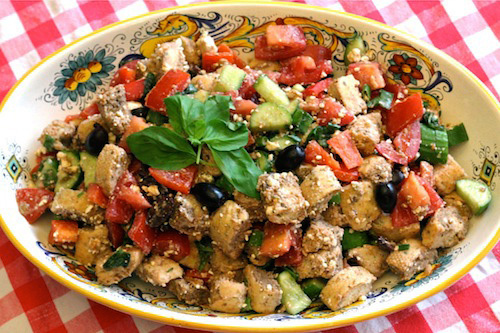 Panzanella is an Italian bread salad dressed with olive oil, vinegar and tossed with tomatoes and basil. Many recipes call for ½ cup of olive oil and those bread cubes just soak it all up. In this version we decreased the olive oil substantially and added some chicken broth to extend the dressing. We used a whole grain seed baguette for added nutrition value. Using a Greek or Mediterranean inspired theme, a few more vegetables were also added. A bit of Feat cheese adds great flavor and a bit of protein. One could add some grilled chicken to make this into a meal. Significantly decreased the amount of fat by decreasing the olive oil but adding additional ingredients so it is flavor packed. A whole grain seed baguette was used for added nutrition value. A healthier version of an Italian classic. In a large bowl, mix the tomatoes, cucumber, bell pepper, onion, kalamata olives and basil leaves. Add the bread cubes to the bowl. Prepare dressing, mix well and pour on salad and toss well to coat. Let the Panzanella sit for at least 10 minutes to soak up the flavors.